This topic contains 13 replies, has 4 voices, and was last updated by Forum Moderator 3 years, 2 months ago. I’ve just purchased the Pro version of the SKT Healing Touch theme, but the homepage boxes don’t work. In the free edition they work fine, but in the PRO version under Theme Options>Section I have specified the pages for each featured box, but it makes not difference to the homepage! Kindly provide us your website link. you can manage the text from these areas thereafter for the homepage. Appearance>Customize>Header upload an image of size: 1400px by 275px to replace the default image. The behaviour of the PRO version is not consistent with the Lite version which is quite frustrating as one expect the PRO version to simply be an extension of the Lite version, not fundamentally different. The Lite version allowed me to still have homepage boxes even with a Static page selected for the homepage. Also, when you load a header image in the Lite version it appears behind the site title and menu on all pages including the homepage, it doesn’t appear below the menu and not on the homepage as in the PRO version. I think you need to provide the option for the PRO version to behave in the same manner as the Lite version. We can get this done. Give us today. By tomorrow we will have it working the same as the Lite version. We can see the slider on our end while setting up front page via readings. So not sure why you can’t see the slider. Do you mind emailing us: support@sktthemes.com with your WordPress admin details? It is not the slider I cannot see with a static homepage, it is the featured boxes. I’ve found a another issue. If I hide or remove Section 2 from the Sections settings then section 1 will not display. I also purchased the theme healing touch pro and I also have problems with the blue home boxes (featured boxes?. After installing the pro-theme the boxes were still visible. I think they became invisible after clicking “Save Option”s in the Theme Options submenue, but I’m not totally shure. I tried to follow your instructions but I never found a way by now to make them visible. Please help, the featured boxes are one of the reasons I selected this theme. 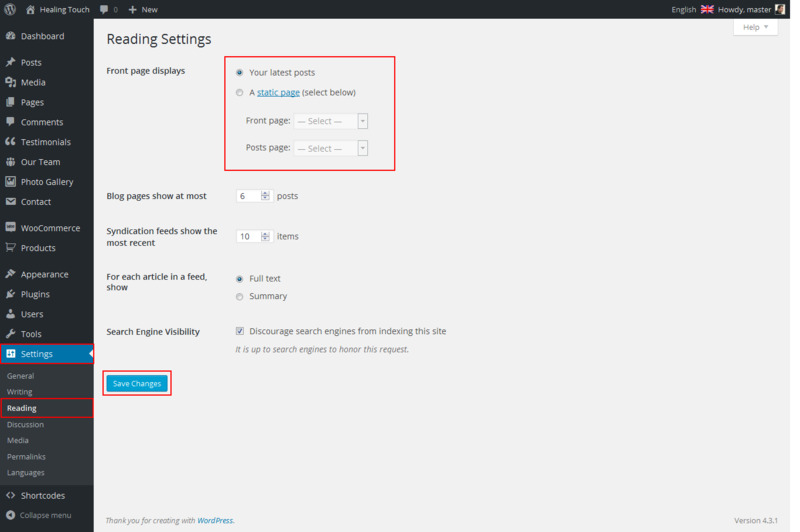 Then go to Appereance>>Theme Option>>Section and select pages to show homepage boxes. Thank you for the quick response. Yes, the homepage boxes are visible now.